We started this study with an overview of the nineteenth century Arab world. 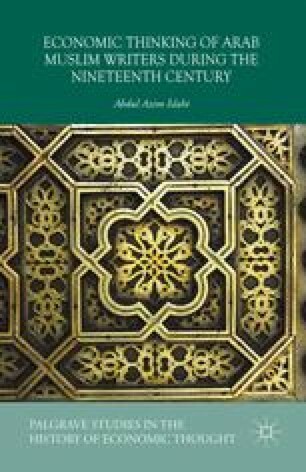 This was an introductory chapter to provide necessary background for an understanding of the contributions of scholars and thinkers from the Arab world to economic thought and analysis. We surveyed their sociopolitical, intellectual and economic conditions. Perhaps, for the first time in history, an Arab educational mission was also sent to study at European universities. The establishment of the printing press provided a boost to knowledge by making books and reading materials easily available to the masses. The publication of journals raised people’s intellectual levels and widened their outlook. The inauguration of railways, the opening of the Suez Canal, and the establishment of the banking system are some very important events that happened in the region. In brief, the Arab world saw multifaceted changes during this period. From a stagnant pre-modern economy at the beginning of the nineteenth century, it became a modern developing economy, at least by the standards of that time, by the end of the century. The most important manifestation of development during this century was the economic awakening that took place in the Arab world, mostly due to increasing contact with Europe.